Watch Scientist Joe with his Dancing Candy Hearts Science Experiment here! 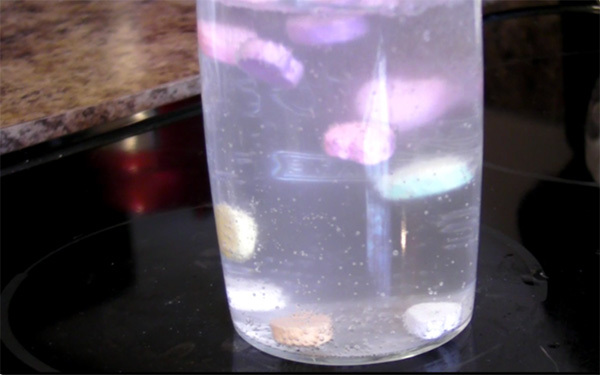 The carbon dioxide picks the candy hearts up and throws them to the top of the glass. When they reach the top, the bubbles burst and the candy works its way down again. Try doing several glasses, but in each glass have only one color of conversation hearts inside. Does one color of conversation heart do better than others? If so, why could that be? Try using several different types of soda (ex. Dr. Pepper, Pepsi, Coke, etc.). Which soda works the best? Try using diet soda versus regular soda. Which soda works the best?